(CBS/WKMG) - Apparently the movie "Snakes on a Plane" wasn't too far-fetched! 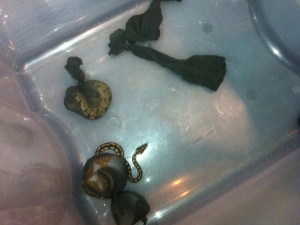 The Transportation Security Administration said Monday that U.S. officials arrested a Brazil-bound man at Miami International Airport last week trying to pass through a security checkpoint with seven exotic snakes and three tortoises hidden in his pants. Insert inappropriate snake jokes here. Thanks to a millimeter wave advanced imaging technology machine, officers at the checkpoint Thursday were able to noticed "items suspiciously hidden" on the man, according to CBS affiliate WKMG. Upon further inspection, there were seven exotic snakes and three tortoises hidden in lady's hosiery inside the man's pants. The man was immediately arrested and charged with violating the Lacey Act, which deals with imports of exotic animals. He faces a maximum of five years in jail. Amazingly, this is not the only case of animals-in-pants-smuggling foiled by the TSA recently. Last week, two endangered birds were found wrapped in socks and taped to the leg and chest of a woman trying to board a flight from Los Angeles to China.